As close to 200 attendees filled the Vodafone event centre on Wednesday 3rd August under the karanga of the Tuia te ako – Māori tertiary education hui, the term whakawhanaungatanga appeared to set the foundation for the upcoming three-day event. With a key theme of enhancing vocational pathways for Māori learner success, this term of whakawhanaungatanga further acted as a korowai in bringing together representatives from the 11 Industry Training Organisations, Institutes of Technologies and Polytechnics, Ministry of Education, Tertiary Education Commission, and more importantly rangatahi from both local kura kaupapa and mainstream schools. This kaupapa aimed to further showcase the benefits of vocational pathways in supporting Māori tino rangatiratanga for whānau, hapū, and iwi. 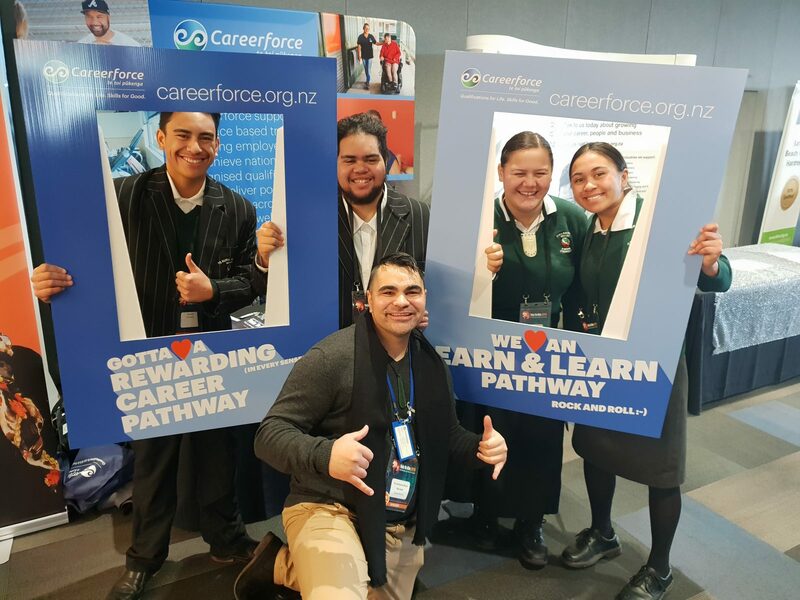 As kaitiaki of the health, wellbeing, social and community services sector, this theme undoubtedly set a challenge for us at Careerforce – te toi pūkenga in being able to enhance sector understanding of the connection between hauora and mātauranga. A challenge gladly accepted under the mandate of our commitment to te iwi Māori – te tangata whenua of Aotearoa. It is widely known that Māori are significantly over represented in poorer learning outcomes when compared to Tauiwi. However, as the plethora of excellent presentations continued to follow, it was disheartening to see the deficit-based statistics, and narratives of inequities had [perhaps unintentionally] worked to perpetuate the historic rhetoric of Māori as a race of academic non-achievers. A narrative which also echoed vocational pathways as the alternative opportunity for Māori who did not achieve in mainstream education settings. Understanding this, we Careerforce – te toi pūkenga chose to challenge this discourse by creating a new narrative which looked to re-situate Māori hauora as the fundamental element and pre-determinant to learning success. Understanding that Māori learning outcomes are not about the ability of the learner, but more so the quality of learner hauora and the environment of whanaungatanga-centred supports which enhance greater wellbeing outcomes. An approach that is not exclusive to the health and wellbeing sectors, but undoubtedly permeates through every vocational pathway where people are the most valuable asset, regardless of the trade environment. We know too well that a plumber can’t fix a leak, if they themselves are about to ‘burst’. A builder can’t be expected to pick up a hammer if they can’t ‘pick themselves up’. A stylist can’t enhance a person’s outer appearance, if they themselves cannot see their own inner beauty. And of course, a support worker cannot hold hope for whānau, when they themselves have lost their own. Basically, when Māori do not feel well, learning does not go well. With this direct approach, we intentionally chose to avoid the rhetoric of pastoral care definitions; with the acknowledgement that this term itself undoubtedly carries a connotation of financial and resource barriers. We chose to redefine pastoral care as whakawhanaungatanga; the creation of mauri-enhancing relationships that directly align with Careerforce’s values of kaitiakitanga, kotahitanga and whanaungatanga. This approach seeks to provide an infrastructure of hauora supports that look to push past these barriers of traditional pastoral care. Quite simply, doing whatever it takes to support the holistic needs of Māori in order to achieve success. This key message of whakawhanaungatanga was also echoed with attending rangatahi; all detailing a sense of belonging, identity and connection within real relationships as a key requisite to their future success in a learning environment. An environment where they can be Māori, where they can ask for help without fear of judgement, where there is acknowledgement of their culture as a protective factor, where tikanga and te reo Māori are acknowledged as a pathway of strengthening relationships, and where their hopes and aspirations can be nurtured from a holistic, relational and collective perspective. All elements further reinforcing a detachment from traditional westernised and Eurocentric perspectives of pastoral care. So what does this all mean for Careerforce? Well, with a clear and direct statement from TEC’S Chief Māori Advisor, Paora Ammunson – the future funding for ITO’s will be dependent on their level of governance and managerial commitment; leadership, vision and ability to increase Māori achievement; we have a clear mandate to support our recently developed whakawhanaungatanga-centred approach. While this is a wero of great magnitude, it is important that we acknowledge this as an organic and continually evolving process, rather than a single event, with a long-term vison and commitment to effective and sustainable approaches to supporting future outcomes. With a future focus in mind, we’ll look to implement this high-level infrastructure of hauora support for every Māori trainee or learner, regardless of the qualification level. This proposed infrastructure acknowledges the importance of investment in early achievement; success that breeds a sense of long-term tino rangatiratanga for the trainee, their whānau, and subsequently greater wellbeing for their iwi, hapū, community and Aotearoa. Whilst this approach is specific to Careerforce – te toi pūkenga, collaboration and partnership with the wider educational sector cannot be underestimated, and in fact is a crucial element to advancing our collective aspirations for Māori success. As mentioned, hauora achievement is not exclusive to the health and wellbeing sector, and there are undoubtedly overlapping interests across the educational landscape. Therefore, we as Careerforce – te toi pūkenga are, and will forever be committed to supporting opportunities to enhance the hauora of all Māori learners; your whānau, our whānau. By working together, all of our people will thrive. Turaukawa is first and foremost a proud father of a child living with autism, a husband and proud Māori. 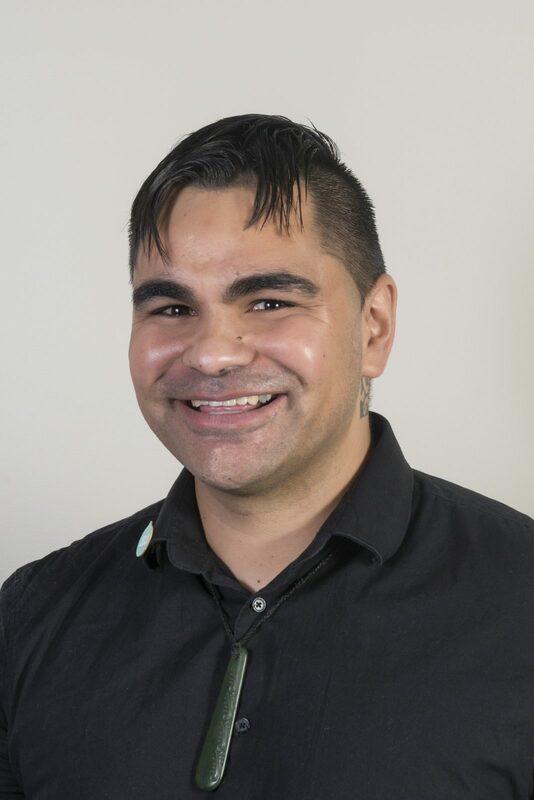 He was the first graduate of the New Zealand Apprenticeship in Mental Health and Addiction Support and a member of the TūKotahi – Suicide Prevention programme. He is also the founder of MANAvation, a school-based early intervention hauora and leadership programme targeting rangatahi Māori. Turaukawa supports Careerforce in enhancing Māori Workforce Development in the health and wellbeing sector, with a strong emphasis on developing a competent, confident and mana–enhancing workforce that truly meets the needs of whaiora and their whānau. We know too well that a plumber can’t fix a leak, if they themselves are about to ‘burst’. A builder can’t be expected to pick up a hammer if they can’t ‘pick themselves up’. A stylist can’t enhance a person’s outer appearance, if they themselves cannot see their own inner beauty. And of course, a support worker cannot hold hope for whānau, when they themselves have lost their own.